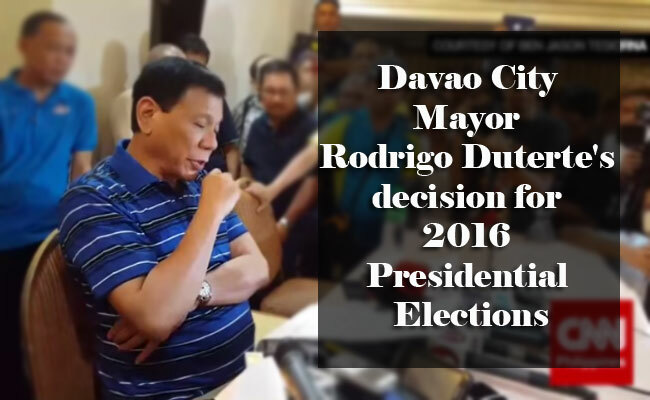 Despite some circulating speculations that Davao City Mayor Rodrigo Duterte will be running in 2016 Presidential elections, the tough mayor said that his supporters must still wait for his decision. Duterte tell media that he had not yet made his final decision on the 2016 elections. The Davao Mayor had announced earlier that he is not even interested in the presidential seat, yet he also does not want to disappoint those who supports him. He than asked for more time to think about it since the filing of Certificate of Candidacy is still yet to come. Duterte admitted that he has no ambition to run in the elections nor had he any motivation as he views the presidential position as very difficult. He shared that being a president is having a lot of jobs to do and he does not have a motivation for that kind of work, however, he had heard that people are even willing to give financial support if he chooses to run. He also acknowledges that there are many groups pushing him to run. On Saturday, Lito Banayo, Duterte’s political adviser, told media that Duterte will run, but his official announcement date has not been decided yet. There had been other speculations that the mayor will indeed run, but Duterte shared that since many wants to support him his advisers tends to create statements that could appease them. Despite the conflicting news on whether the mayor will run, thousands of people had gathered in Quirino Grandstand last September 26, to push the mayor to run as a presidential candidate. Should Duterte run, there are speculations that he would run with either Senators Alan Peter Cayetano and Ferdinand "Bongbong" Marcos Jr. who had both announced that they will run fro vice president. Cayetano also shared that it Duterte does not choose him, he will still support the mayor and would even give up his own resources. Cayetano had met with Duterte after his official announcement to run as a vice president. The law maker shared that though Duterte never shared his decision about the elections, it is evident that the mayor is concern in the national issues including the states of the OFW’s. This gives Cayetano the notion that Duterte is ready to serve the country in the national scale.